One is dead and will more follow, for three elephants have been mowed down by the Colombo Fort-Omanthai mail train at the 97.5 milepost between Galgamuwa and Ambanpola at about 3 a.m. last Tuesday. Ironically this is not the first but the third time that elephants have been knocked down at the same location. It was in June this year that three gentle giants died an agonising death after being hit by a special train carrying Poson pilgrims. A few years prior to that another three were killed practically at the same spot. Knocked by the train and then dragged by its engine, one young female elephant had her head bashed in and injuries on her abdomen where the train hit her. She fell by the roadside next to the track, was treated by the Department of Wildlife Conservation (DWC) but gasped her last later in the morning, Sampath Ekanayake of the Centre for Conservation and Research told the Sunday Times, describing the tragic incident. An older female with a one-week-old baby was observed kneeling and stumbling across the road and into the forest at around 6 a.m. with a broken left rear leg and injuries on the abdomen. The third, a male with injuries on both rear legs had dragged himself across the road. He had fallen trying to cross the Mee-Oya into the forest but managed to pull himself into the forest, he said. 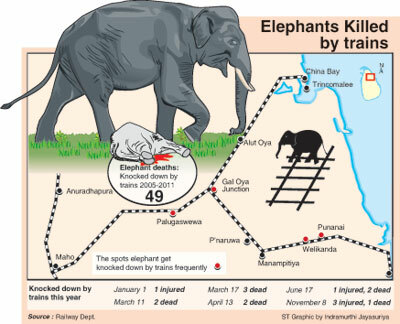 “As soon as we heard about the accident, we instructed the driver not to move the train until the elephants had dispersed,” said the Railways Department Additional General Manager N. Bandara, explaining what action the railway authorities have taken in collaboration with the DWC to prevent such elephant deaths. The train was not moved for 111 minutes (nearly two hours), he said, adding that soon after the accident not only the DWC and the police but also railway officials went to the location. Referring to the action taken by the DWC-Railway, he said that “running staff” of the railway who man the trains in areas where elephants cross the tracks have been made aware through workshops, while the scrub jungle by the side of the track, especially at bends has been cleared to give a better view to engine drivers. In addition to the single bright headlight of the train, moves are underway to provide more lighting, said Mr. Bandara, pointing out that moves to take a DWC official in the engine to advise the driver will also be strengthened. They will know where the elephant herds are and in what direction they are moving, he said. While advising local government bodies not to dump garbage near the railtrack in the Gal Oya and Hingurakgoda areas attracting elephants to such garbage, he said that action will be taken to straighten the track at points well-known for elephant crossings. Many points where elephants cross the railway track have been identified, said Mr. Bandara, pointing out that there are 10 between Maho and Vavuniya, 13 between Palugaswewa and Gal Oya, 14 between Gal Oya and Trincomalee and 10 between Gal Oya and Batticaloa. Conservationists, however, question why after “all this action” more and more elephants are hit by trains, tragically at the same spots. What is needed is not “action” but “effective action” they point out. The present tragedy brings the debacle into sharp focus as in this instance the elephants are being hit and killed at a place so well known as an elephant crossing, with DWC and Railway Department signboards clearly indicating so and imposing speed limits of 20 kmph. Are the trains following the speed limits, ask conservationists. If the Railway Department claims that they are, obviously then the speed limit needs to be lowered to 10 kmph, they suggest. An investigation was supposed to have been conducted after the incident in June and no doubt another will be after this. However, what effect it will have in preventing such tragedies is questionable, they add. Two cow elephants and one bull elephant were knocked down by the train, a wildlife conservation source confirmed to the Sunday Times.